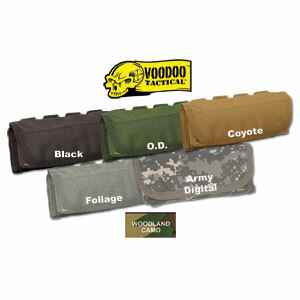 The Voodoo Tactical Shotgun Ammo Pouch holds a dozen 12-gauge rounds securely in elastic webbing. 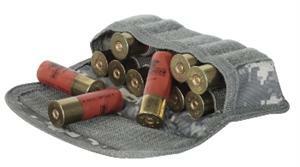 Keep your reloads safe and dry while on the move and reload from your pouch when needed. Measures 7¼" x 3¾" x 1½". Fully compatible any U.S. Military Style (M.O.L.L.E.) gear. Pouches will keep all your gear protected at the ready. Can be placed on the vest and are held in place with attached reinforced snap-straps. Pouches also have straps that accept A.L.I.C.E. clips so they can be worn with A.L.I.C.E. gear, pistol belts, etc. Available in Black, O.D., Coyote, Foliage, Woodland Camo, or Army Digital. Available in Black, O.D., Coyote, Foliage, or Army Digital. As advertised, quality material, good stitching. The elastic band on the inside holds the shells fairly tight, so load it up an leave it sit a while for the elastic to relax an shape itself. Just like with any new material its stiff, so ya gotta break it in. I am very pleased with my purchase.